Senior Jackie Choi discussed her difficult transition from high school to Hopkins. TEDxJHU hosted its first event of the school year “What They Didn’t Tell You at Orientation” featuring student speakers and performances by student groups at the Mattin Center on Tuesday. The mission of TEDxJHU, the independent chapter of the TED Conferences, is to spread ideas and experiences through personal stories, according to event organizer and senior Eric Chen. “We don’t really want people because of their important credentials, but rather because they have important stories to share. It doesn’t matter where they come from, whether from outside or inside Hopkins,” Chen said. 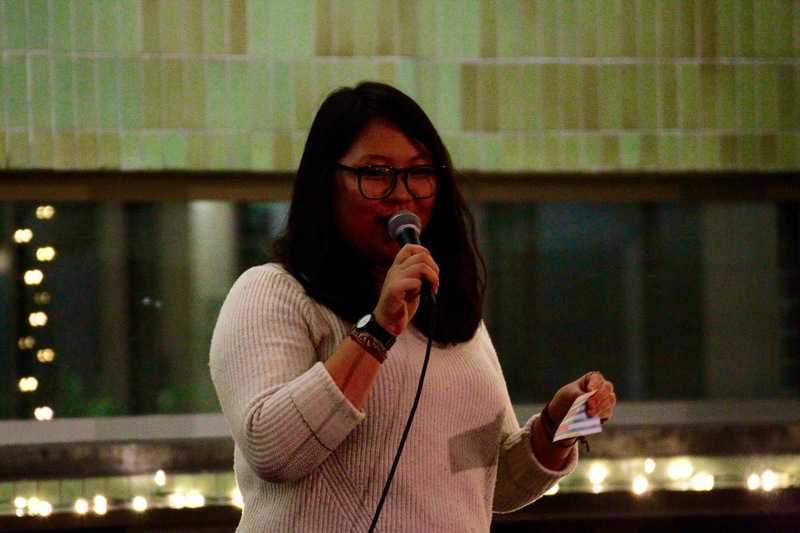 Senior Jackie Choi opened the evening by speaking about the social and academic struggles she has faced during her years at Hopkins, which contrasted greatly with her experiences in high school. She then connected her competitive nature to the rigors of college life. Her thoughts on failure resonated clearly with many members of the audience. Students felt that in a culture that focuses on successes, the Hopkins environment makes them perceive failure as something entirely negative. Choi then discussed the repercussions of an experience when she was insulted about her appearance by a fraternity brother. “I obviously was hurt. It sucked. It was embarrassing because it was in front of a group of peers who were all laughing at me. I was avoiding friends… Instead of enjoying homecoming, enjoying Spring Fair, I went online,” Choi said. In addition to social failure, she also shared her academic failures and how she persevered to pass a thermodynamics class on her second try. Many members of the audience felt encouraged by Choi’s words. “She gave a very unique perspective on people. People always like to talk about success, and it was very interesting to hear her talk about failure,” graduate student Rahul Nair said. Choi said she was motivated to speak because she wanted to break the stereotypical model of success. Often she felt pressured to question whether she belonged at Hopkins whenever her grades were not what she had hoped. “For every 4.0 student there are people here who do well and pass. I don’t want to necessarily denigrate people who do great academically — they should be praised for their success — but I wanted to give exposure to the fact that other people deserve support and recognition, too,” she said. The next speaker, senior Jordan Matelsky, founded ShapeU, an online tool for Hopkins students that allows them to set personal health goals, track their fitness progress and speak to a professional trainer. He describes himself as an entrepreneur who enjoys using his computer programming skills to solve problems. “During freshmen year I went to a party, as freshmen do. I met a group of upperclassmen, and we started talking about technology, medicine and the sad state of electronic health records. They’re inconvenient for physicians to use and inconvenient for patients to understand,” he said. Although Matelsky could not redesign electronic health systems in the United States, he devoted hours to a project with a group of friends who were interested in developing a more basic system for a developing country overseas. Then he decided to co-found his own company. When he founded ShapeU in his junior year, Matelsky considered dropping out of college to develop his business, but he ultimately decided to keep his business based at Hopkins. However, he says that Hopkins can do a better job of helping undergraduates with ideas and projects to pursue them. He encouraged students to overcome barriers despite the fact they may feel unprepared or scared. In his view, the demands of being an entrepreneur closely match his philosophy on life. The evening of TED Talks, rounded off with performances by the AllNighters and the Johns Hopkins Entertainers Club.